When running Minecraft at an aspect ratio taller than 16:9, the crafting UI changes. 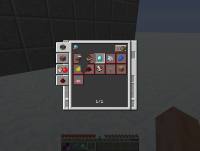 Normally, when you use the new recipe book in a crafting table, it will appear beside the crafting table UI, so that you can view and craft at the same time. However, in taller aspect ratios than 16:9, this functionality is lost, because the UI appears above the crafting table, and when any recipes are clicked, the UI disappears, but the recipe does not show up on the crafting grid. To be clear, the UI works fine with aspect ratios SHORTER than 16:9, so 16:8, etc, works fine. But things like 3:2, 4:3, or 1:1, or example, don't work. As described in MC-115071 the "inventory" rendered behind the crafting help is not actually the player inventory. The slots appear always empty even if the player has items in these slots. The player model is rendered in gray in front of the recipe book GUI, see MC-116761. I'm actually no longer experiencing this issue. On my device, it works fine. For me, It was fixed in 17w14a, but still affects other people. Not sure if this information is important, but thought I would mention it. MC-115071 Crafting Recipe UI Doesn't Render In The Correct Position. MC-116041 Inventory screen and recipe screen collide when resizing screen..?